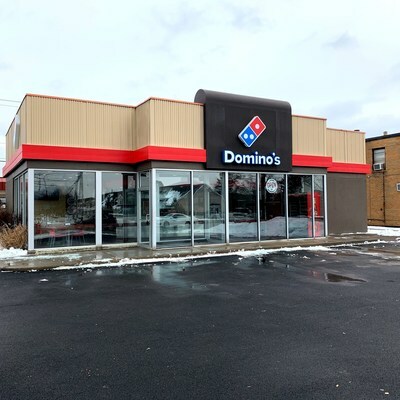 ANN ARBOR, Mich., March 4, 2019 /PRNewswire/ -- Domino's Pizza (NYSE:DPZ), the largest pizza company in the world based on global retail sales, is celebrating the monumental grand opening of its 16,000th store in the world today, in Cheektowaga, New York. "This is an incredible milestone for Domino's, and I am beyond excited it is happening in Cheektowaga," said Ritch Allison, Domino's president and CEO. "We've grown our total global store count by nearly 4,800 stores in the past five years, and we couldn't be more thrilled to commemorate our 16,000th store in the world, right here in New York." The commemorative 16,000th store, located at 4395 Union Rd., will host a ribbon-cutting ceremony with Allison, COO & President of the Americas Russell Weiner, Cheektowaga, Domino's franchise owner Allan Erwin and other key company executives on Monday, March 4 at 11 a.m. Erwin will also present a $16,000 donation to the Cystic Fibrosis Foundation, Western New York Chapter, in honor of the 16,000th store. "Having the Cheektowaga community be a part of this milestone is very meaningful to me, as does being able to give back to the community," said Erwin. "The Domino's team and I are honored to support a great local organization that helps cure cystic fibrosis and provides all people with the disease the opportunity to lead full, productive lives by funding research and drug development, promoting individualized treatment, and ensuring access to high-quality, specialized care. Erwin began his career with Domino's in 1993 as a delivery driver. He purchased his first store in 1998 – just five years after joining the company. He now owns 37 stores throughout New York, North Dakota, South Dakota, Montana and Wyoming. He is not alone – more than 90 percent of Domino's U.S. franchise owners began their careers as delivery drivers or pizza makers in Domino's stores.